Bid find auction ring starts at 10:00am every Saturday and features everything from antiques, collectibles, appliances, home décor, art and furniture. This ring averages anywhere between 450 – 650 lots being sold every week. Everything in this ring is sold weekly so the inventory changes from week to week. This ring is set up in vignettes to give buyers a visual look of how it would look in a home and in turn gives the sellers a higher price realization because people are buying based not only on the desire to own the item but on how it will look in their home. Every item in this ring is cleaned, photographed, cataloged and then placed online for a live online video simulcast auction. Buyers do not have to be present in our facility to bid on these items as they are online for the world to see. We have sold items from this auction ring to people all over the world proving our marketing system is providing the highest level of exposure possible. So if you’re looking to buy or sell EJ’S auction has the answer for you! Choice Find starts every Saturday at 10:00am every Saturday and features small antiques, jewelry, firearms, collectibles, art, sculptures and more. This ring averages anywhere between 400 – 500 lots being sold every week. Everything in this ring is sold weekly so the inventory changes from week to week. Every item in this ring is cleaned, photographed, cataloged and then placed online for a live online video simulcast auction. Buyers do not have to be present in our facility to bid on these items as they are online for the world to see. We have sold items from this auction ring to people all over the world proving our marketing system is providing the highest level of exposure possible. 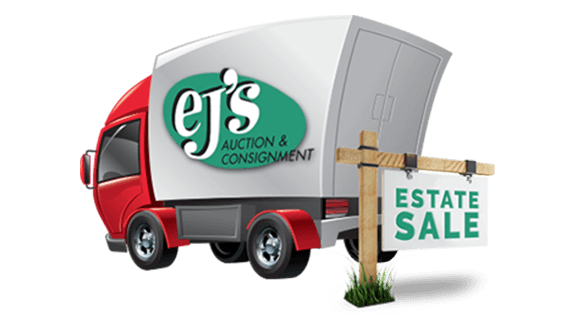 So if you’re looking to buy or sell EJ’S auction has the answer for you! Crate Find starts at 10:00am every Saturday and features small items boxed in EJ’S custom made boxes. These items are typically all those small items such as china, glass, flatware, toys, power tools, pots & pans and much much more that are generally hard to sell as a stand alone item so they are grouped in lots that are desirable. This ring averages anywhere between 550 – 750 lots being sold every week. Everything in this ring is sold weekly so the inventory changes from week to week. Every item in this ring is cleaned, photographed, cataloged and then placed online for a live online video simulcast auction. Buyers do not have to be present in our facility to bid on these items as they are online for the world to see. We have sold items from this auction ring to people all over the world proving our marketing system is providing the highest level of exposure possible. 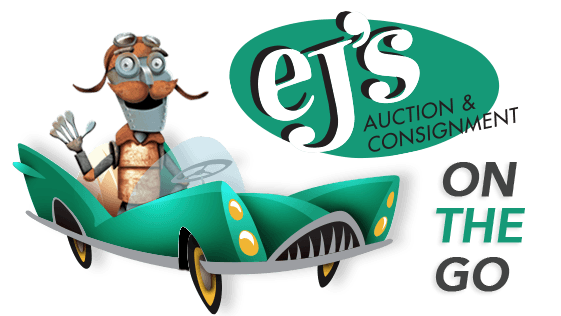 So if you’re looking to buy or sell EJ’S auction has the answer for you! Having an onsite Estate auction has some very good attributes such as an onsite auction creates a buying frenzy when marketed properly and most everything sells! Typically everything worth value will be sold leaving no leftovers that must be dealt with and in turn saves you time & money. In the event you have items left over we have found these items hold little or no value and we are able to remove those items and take to a local charity that accepts those items. All items that are donated would be at your direction and you get the tax donation receipt. At the completion of the auction all items will be removed and the home will be broom swept and all debris removed. EJ’S auction and consignment can tailor any situation into a viable estate liquidation. Sometimes an executor or personal representative can be tentative on holding an auction and in those cases EJ’S can implement an onsite Estate sale strategy that will alleviate those concerns. Our experienced staff can clean, organize, price and prepare just about any property. Our years of marketing experience in the Estate liquidation industry gives us the advantage EJ’S has a client base that reaches not only a national level but worldwide which in turn gives our clients higher prices realized for the property we are selling. One of the largest issues facing Estate sales is all the items left over that don’t sell. With EJ’S this isn’t a worry our multi faceted system will allow for the transfer of the items left over into our retail auction & consignment facility where those items can be converted into cash either by auction or our in store consignment area. Open to the Public. Everything Must Sell!